I'm always looking for good books for my tweens. It's really difficult to find books that are interesting and also age appropriate, especially for my book-loving Ballerina. When we were asked to review Brian Wells' book The League and the Lantern, I couldn't wait to let Ballerina read it. Brian Wells is a concerned dad who couldn't find quality entertainment for his children. He has worked on and produced 15 TV movies for major networks. The League and the Lantern is his book debut. 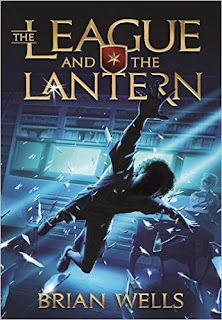 The League and the Lantern is the first book in a new adventure series for middle-school readers. It all starts when a dangerous organization invades Jake Herndon's seventh-grade sleepover. He escapes along with two new classmates, Lucy and TJ, only to face a 48-hour fight for survival on the streets of Chicago. The kids unravel a mystery dating back to the Civil War and an incredible secret about Jake's family. Along the way they learn unexpected lessons about courage, family, and friendship. The League and the Lantern is not only a good book for middle schoolers, it is also educational, containing 140 key vocabulary words hidden throughout the story as well as historic sites as part of the setting. Ballerina is a history fanatic, and she and I really liked the amount of history interwoven throughout the story. Another aspect of the story that I appreciated was the lessons in family, friendship, mercy, and compassion. As I said earlier, it's difficult to find books that I find appropriate for my tween girls; when I can find one that includes positive moral values, it makes me very happy. Ballerina: "This book was very intriguing. I couldn't put it down because there was a lot of action and humor. The history included in it was also good. The ending was surprising and makes me want to read the next book in the series." This adventure series is definitely one that your children will want to read. You can find The League and the Lantern at the official website - LeagueAndLantern.com. Not only was I given the opportunity to review The League and the Lantern, but I also get to give away a copy of the book to one of my lucky readers. Just enter the giveaway below for your chance to win.